Sometimes my Happy Snails are so adorably small they need their own tiny toadstool to curl up and read in, away from the hustle of the other Happy Snails. 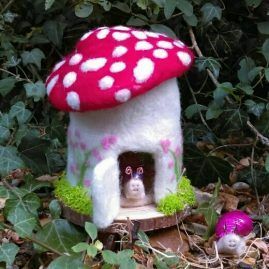 Toadstool fairy house measures just 10cm tall and is complete with interior decor – a lovely landscape picture, a miniscule woodburner, lovely thick pale pink curtains, and a wonderfully soft pink rug. The Happy Snails collection is one of the most fun and quirky ideas I’ve had to date. They make the most perfect gift – for pretty much every occassion! My Mascot, Mii’Shelle, has been asking me to create a whole tribe of Happy Snails so that the whole world can join her in her quest to make people smile. No living snails are ever harmed in the making of the Happy Snails, my family and I find the empty shells in our gardens, wash them and then I turn them into the Happy Snails. The fabulous fly agaric toadstool house and all its blossom, and interior decor, is also made from corridale and merino wools and then firmly attached to a little wood slice which is decorated with a small amount of artificial moss. Perfect! Happy Snails, their houses and accessories are collectables and unsuitable for children under 14 due to small parts. I have various medical conditions that prevent a ‘normal’ job, so I started crafting as a way to stay sane. I am a Familial Hemiplegic Migraine Warrior. I also have Fibromyalgia and Chronic Fatigue, which bring with them other associated illnesses. We ensure all items that are posted to our customers are of the highest standard but if there is ever a need to return an item we do accept returns for a full refund. Under The Consumer Contract Regulations, your right to cancel begins from the moment you place your order, up to 14 working days after receiving your order. Your right to cancel is unconditional. If you wish to return an item, please notify us in writing (cerijsmith@aol.co.uk). We will then process your return. We would be grateful if you would return your items via recorded or tracked post, this is for your peace of mind, and ours. This is not a requirement of law, this is a courtesy request. Please note there will be no refunds on sale items – unless faulty. Items marked as being reduced for having a defect, damage or any other reason will be exempt from the returns policy. Returning Custom Items: Custom made items are exempt from The Consumer Contract Regulations – the only exception being is if they’re faulty. In this case, please refer to the returns section of this document.